user warning: Expression #6 of SELECT list is not in GROUP BY clause and contains nonaggregated column 'hotkilns_live.nodequeue_nodes_node.position' which is not functionally dependent on columns in GROUP BY clause; this is incompatible with sql_mode=only_full_group_by query: SELECT DISTINCT(node.nid) AS nid, node.title AS node_title, node_data_field_videos_category.field_videos_category_value AS node_data_field_videos_category_field_videos_category_value, node.type AS node_type, node.vid AS node_vid, nodequeue_nodes_node.position AS nodequeue_nodes_node_position, term_data.name AS term_data_name FROM node node LEFT JOIN nodequeue_nodes nodequeue_nodes_node ON node.nid = nodequeue_nodes_node.nid AND nodequeue_nodes_node.qid = 11 INNER JOIN search_node_links search_node_links_to ON node.nid = search_node_links_to.sid LEFT JOIN content_type_videos node_data_field_videos_category ON node.vid = node_data_field_videos_category.vid LEFT JOIN term_node term_node ON node.vid = term_node.vid LEFT JOIN term_data term_data ON term_node.tid = term_data.tid INNER JOIN node_access na ON na.nid = node.nid WHERE (na.grant_view >= 1 AND ((na.gid = 0 AND na.realm = 'all') OR (na.gid = 0 AND na.realm = 'content_access_author') OR (na.gid = 1 AND na.realm = 'content_access_rid'))) AND ( (node.status = 1) AND (node.type in ('videos')) AND (search_node_links_to.nid = 1075 ) )GROUP BY nid ORDER BY nodequeue_nodes_node_position ASC, term_data_name ASC in /home/hotkilns/public_html/sites/all/modules/views/includes/view.inc on line 814.
user warning: Expression #6 of SELECT list is not in GROUP BY clause and contains nonaggregated column 'hotkilns_live.nodequeue_nodes_node.position' which is not functionally dependent on columns in GROUP BY clause; this is incompatible with sql_mode=only_full_group_by query: SELECT DISTINCT(node.nid) AS nid, node.type AS node_type, node.vid AS node_vid, node.title AS node_title, node_data_field_pdfs_category.field_pdfs_category_value AS node_data_field_pdfs_category_field_pdfs_category_value, nodequeue_nodes_node.position AS nodequeue_nodes_node_position FROM node node LEFT JOIN nodequeue_nodes nodequeue_nodes_node ON node.nid = nodequeue_nodes_node.nid INNER JOIN content_type_pdfs node_data_field_pdfs_international ON node.vid = node_data_field_pdfs_international.vid INNER JOIN search_node_links search_node_links_to ON node.nid = search_node_links_to.sid LEFT JOIN content_type_pdfs node_data_field_pdfs_category ON node.vid = node_data_field_pdfs_category.vid INNER JOIN node_access na ON na.nid = node.nid WHERE (na.grant_view >= 1 AND ((na.gid = 0 AND na.realm = 'all') OR (na.gid = 0 AND na.realm = 'content_access_author') OR (na.gid = 1 AND na.realm = 'content_access_rid'))) AND ( (node.status = 1) AND (node.type in ('pdfs')) AND (node_data_field_pdfs_international.field_pdfs_international_value = 1) AND (search_node_links_to.nid = 1075 ) )GROUP BY nid ORDER BY node_data_field_pdfs_category_field_pdfs_category_value ASC, nodequeue_nodes_node_position ASC, node_title ASC in /home/hotkilns/public_html/sites/all/modules/views/includes/view.inc on line 814. 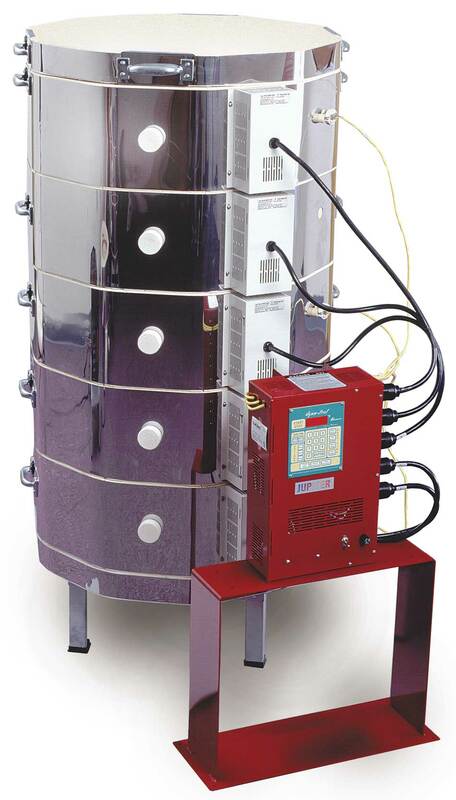 L&L's Pull-Apart Kiln Option utilizes a unique feature of the Jupiter kilns. Each 9" high section of the kiln plugs into a separate control panel. For the Pull-Apart versions we mount the control panel on a stand. The lid just sits on top. Each section can be unplugged and removed one at a time over a large sculptural piece. This configuration is mostly used on Jupiter Automatic Kilns and ususally the tall 36" and 45" high models. It is also possible to make DaVinci square and rectangular kilns in pull apart versions. The lid is does not come with a hinge when you get the pull-apart option. See this page for details.